How do transport/carrier proteins rotate during facilitated diffusion? In my book, it is written that when a molecule binds to the carrier protein then the protein rotates and releases the molecule inside the cell. I want to know how is this possible. Wouldn't the surrounding phospholipid molecules or other proteins hinder its rotation? "How do transport/carrier proteins rotate during facilitated diffusion?" Figure 11.1 shows an extracellular molecule bound to the transport protein; the transport protein then rotates and releases the molecule inside the cell. ... is an oversimplification, to say the least (you could simply say that this is plain wrong). What really happens is way more complex. We call it conformational change. Thus, as you can see, we have conformational states: one of them exposes the binding site to the extracellular space, while the other one exposes the binding site to the cytosol. Just like what happens when an enzyme changes conformation, the 3D changes in the protein structure are quite small, and it's hydrophobic regions keep in the same place in both states. Source: Alberts, B., Johnson, A. and Lewis, J. (2002). Molecular biology of the cell. 1st ed. New York: Garland Science..
Not the answer you're looking for? Browse other questions tagged biochemistry cell-biology cell-membrane or ask your own question. Do Acyl Carrier Proteins and Conenzyme A have similar reactivity? How is it that ionic diffusion is independent of other ions? How are ions 'pumped' across a membrane during electron transport? How do ion channels transport only specific ions? 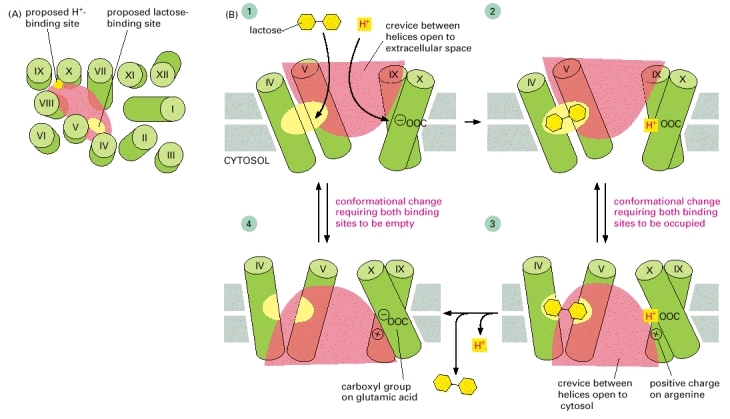 How does 'phosphorylation of glucose' maintain concentration gradient in membrane transport (facilitated diffusion)?